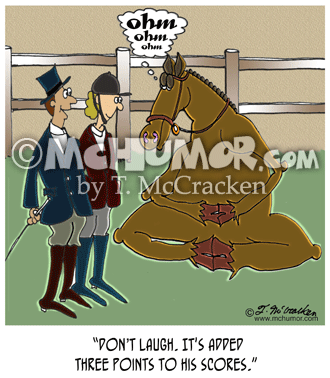 Horse Cartoon 8139: A horse trainer saying of a horse sitting in a yoga position, "Don't laugh. It's added three points to his scores." 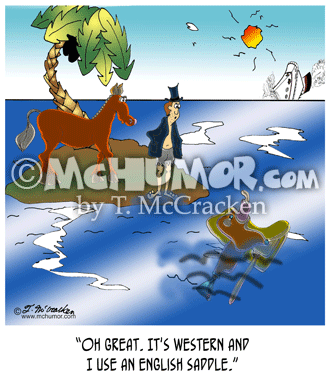 Horse Cartoon 8190: A man on a desert island with a horse sees a saddle wash up on shore and says, "Oh great. It's Western and I use an English saddle." 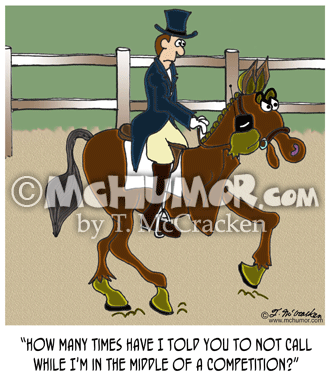 Horse Cartoon 8191: A horse in a competition holds his cellular phone in one hoof while trotting says, "How many times have I told you to not call while I'm in the middle of a competition?" Horse Cartoon 8192: "Horse Play." 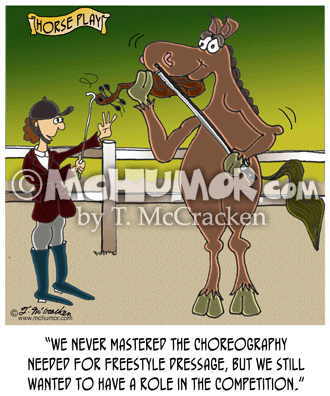 A rider says of a horse playing a violin, "We never mastered the choreography part of freestyle dressage, but we still wanted to have a role in the competition." 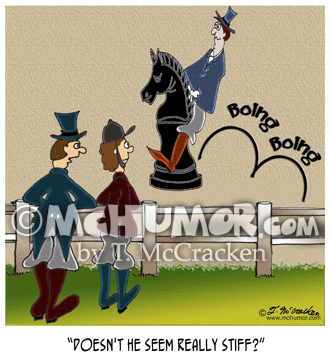 Horse Cartoon 8193: Of a huge chess knight hopping around in a dressage competition someone says, "Doesn't he seem really stiff?" 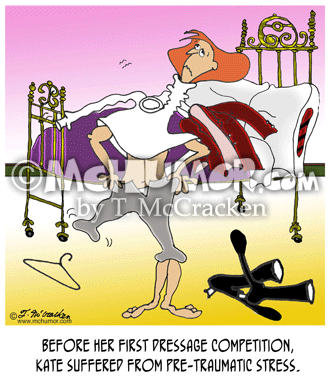 Horse Cartoon 8194: "Before her first dressage competition, Kate suffered from Pre-Traumatic Stress." A nervous rider getting dressed puts both feet into one pant leg and her head through a shirtsleeve. 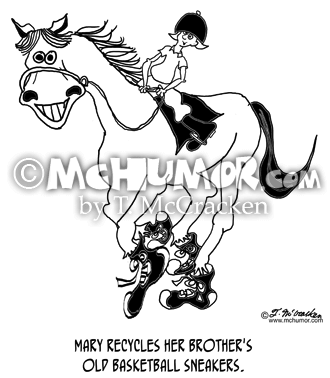 Horse Cartoon 8516: A kid riding a horse wearing tennis shoes. "Mary recycles her brother's old basketball sneakers." 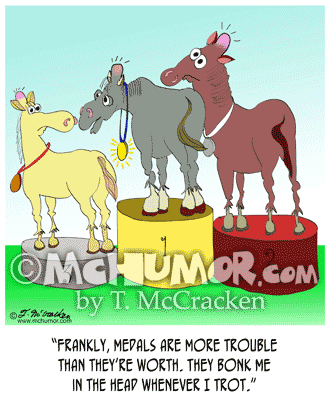 Horse Cartoon 8745: Three horses, each with a big bump on their head and a medal stand on winner podiums. One says, "Frankly, medals are more trouble than they're worth. They bonk me in the head whenever I trot."